Doesn’t your cat deserve to be pampered, after just like you, your cat needs a nice warm place to sleep. This outdoor heated cat bed is ideal for any cat that sleeps outdoors. The internal thermostat keeps the surface nice and warm even in the coldest of temperatures. 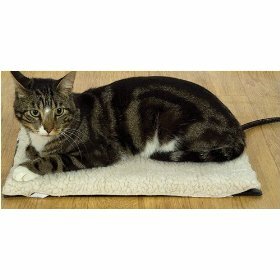 As this heated cat bed is designed for outdoors you can place it in a shed, garage, barn, outdoor porch, patio or anywhere else your outdoor cats spend their time. Veterinarians also recommend this pad for therapeutic post-surgery convalescence and to comfort older and arthritic cats. The heated cat bed is made out of tough ABS plastic which makes it both durable and easy to clean, but you wouldn’t expect your cat to sleep on plastic so there is a fleece cover included so that your cat will be cozy and warm. The heated cat bed has thermostatically controlled heating unit which keeps the temperature at a comfortable102 ° F which is ideal for your cat’s body temperature. And a great thing about this bed is that it can be placed flat on the floor or your can attach it to the wall, so this is ideal for cats that spend time in garages, barns, sheds or outdoor porches. The pad measures 12 1/2 in. x 18 1/2 in. and it uses only 40 watts.